A timeline of company formations, product launches and M&A activity among design exploration and optimization software vendors maps the pace and direction of the industry’s development. Ora Research investigates new technologies that foster innovation, quality and performance and reduce schedule, cost and risk in the engineering of manufactured products and constructed assets. We seek to identify technologies yielding high return for initial adopters, and on the cusp of first-wave mainstream acceptance. We conduct sponsored multiclient studies and provide commissioned research and advisory services to help engineering organizations evaluate, select and justify new technology investments; to help technology providers qualify and quantify emerging market opportunities, validate demand drivers and craft competitive positioning; and to give institutional investors insight into industry competitive dynamics, revenue and growth potential, and emerging market opportunities for technology providers. Our Research Briefs, white papers and press articles report our latest findings. Our goal is to foster insight and action that strengthen the industries we serve. Negotiating with customers is Tony Hemmelgarn’s wheelhouse. Before he took the positions of CEO and president, he was responsible for Siemens PLM’s global sales. He’s also been an account manager, and for a while he had sales leadership in Europe. How will his extensive sales experiences affect Siemens PLM? Hemmelgarn noteded. “Our customers are extremely important to us.” Not only in their capacity as buyers of Siemens software, but also as technology drivers. “Sometimes the challenge with a customer is that it’s not so easy just to cut over to the new thing. You’ve got legacy systems to deal with, so usually what holds us back is not the desire to go. It’s just that they’ve got existing processes we have to work around. Sometimes you have startup companies; with new companies it’s easier since they don’t have legacy systems, and that makes a big difference. It allows them to run fast. Large, established companies can create special teams to go and do this. But at the end of the day, they’ve still got existing processes and you still need to integrate into that,” Hemmelgarn said. Is Mentor Graphics Worth the $4.5 Billion Dollars Siemens Paid? One thing that strikes me while speaking with Tony Hemmelgarn is his emphasis on the big picture. The world of product development and manufacturing is getting more and more complex. Industry 4.0, digitized factory concepts, IoT, digital twins and virtual reality – there’s a lot going on. Plus, the landscape of disruptive IT solutions is growing to an extent where it is getting hard to grasp the whole. Some would say this makes for a stormy, almost chaotic, development climate. Others refer to it as “the perfect storm.” Siemens PLM’s new CEO belongs to the latter group, and sees very few limits to what can be done. Siemens isn’t buying Polarion simply to get hold of a software applications tool. They are acquiring it to become a part of the Teamcenter platform and extend their general ability to handle the entire product realization process. The same goes for LMS, CD-adapco and most certainly for Mentor Graphics. “We’re talking about how everything can come together,” said Hemmelgarn. Is Mentor worth the $4.5 billion Siemens paid? “You can always debate the price,” Hemmelgarn continued, explaining that it boils down to the question of what can be done with it, and how Mentor fits into Teamcenter’s platform structure. “I think we really have something unique here. We’re the first company that brought together the idea of mechanical / electrical / software in one environment. When you think about what Mentor brings to the table, this idea of bringing together electrical, software and mechanical, whether it’s in integrated circuits (IC) or in printed circuit boards (PCB), there are other parts of Mentor that are really interesting as well. For example, we do a lot of work today in systems engineering; how we manage the requirements, whether they are functional, physical or whatever it is to drive the product definition,” Hemmelgarn said. But there’s more. Embedded systems and software, for example – what does that mean? “Now you can make decisions in the context of the whole product. The value we can bring with Mentor is about crossing those silos.” Hemmelgarn concluded. DIGITAL TWINS ARE A CENTERPOINT. The idea of digital twins is a centerpoint in Siemens’ digital factory concept. The key is to produce a digital twin of the entire value chain. 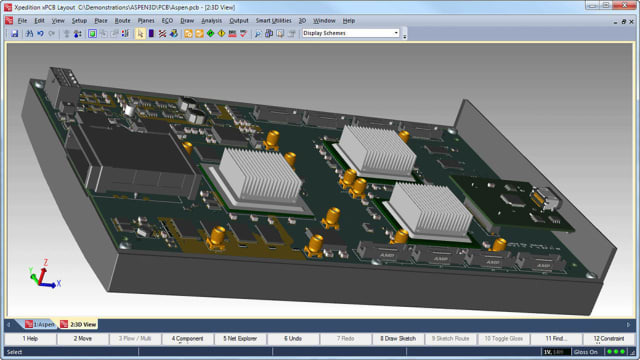 This enables designers, engineers and operators to collaborate within a completely virtual world where they can design, simulate and iterate on the product. The digital twin idea comprises not only the product but also the factory, the equipment and the logistics systems. The secret is to understand what is going on and equip yourself with the right tools. “The best in class tools,” clarified Hemmelgarn, pointing to Siemens’ high-end CAD solution, NX, as one such tool. In the generally slow-growing CAD market, Siemens had an amazing breakthrough when Daimler decided to swap out Dassault’s CATIA V5 in favor of NX a couple years ago. 6,500 new licenses in one deal is a unique event. TEAMCENTER AND SIMATIC AUTOMATION PROCESS SOLUTIONS. One strength in light of Siemens’ Industry 4.0 ambitions is the close connection between its PLM suite Teamcenter and factory floor solutions such as Simatic IT, which is a portfolio for manufacturing operations and manufacturing execution systems. The combination between its extensive PLM environment and the strong environment in manufacturing contributes to the strong hand Hemmelgarn is holding. Siemens’ strategy hasn’t changed. The company is still looking at emerging trends to make sure that they have them covered in their platforms and processes. The long-term challenge is to make sure they’re integrated, and to get them through the entire work stream that they see in Industry 4.0. “You can’t say: ‘Well, I’m going to do R&D, and I might do a feedback loop from the service group, but I won’t do anything in manufacturing. That seems foolish to me,” Hemmelgarn said. The short-term challenge is keeping pace with the technology that’s there today. IoT is one where there’s still some work to do – although the Mindsphere solution is a great start. As with anything offered as platform-as-a-service, however, the key with IoT is not to duplicate what you can get from the marketplace today. EXTREMELY LOW FAULT RATE. Siemens’ Amberg facility: Out of around one million produced products a month, the fault rate is extremely low, the entire 99.99885% right from the start. When German chancellor Angela Merkel visited Siemens electronic factory in Amberg back in 2015, she was impressed. The facility is among the most modern and advanced in the world, and stands as a good example of Industry 4.0 and the concept of a digital factory. Furthermore, it represents exactly what German industrialists in general believe to be the best way to compete with the emerging Eastern countries and the low cost profile that attracted Western industrial production owners to establish plants there instead of in their home countries. This concept, translated into a practical platform, can make that stream more efficient than building trade walls. With the Teamcenter Suite and its connection to Siemens’ manufacturing hardware and software solutions represented by Siemens Simatic, the TIA Portal and other automation solutions, Hemmelgarn holds a strong hand, which is regarded as the strongest in the market by many observers with deep industrial insights. If anyone can produce an Industry 4.0 type of platform, it’s Siemens PLM and the Digital Factory division. Together, they are big enough in terms of resources and competence; in-house they have one of the most–if not the most–advanced PLM and MOM (Manufacturing Operations Management) software, systems and services. And with over 15 million licensed seats and more than 140,000 customers worldwide, they can reach exactly the kind of customers that would be interested in these kinds of ventures.